The Question: In a new report, researchers at the Center for Disease Dynamics, Economics & Policy (CDDEP) conducted stakeholder interviews in Uganda, India, and Germany, and literature reviews to identify key access barriers to antibiotics in low-, middle-, and high-income countries. The report makes several recommendations proposing action on antibiotic and diagnostics research and development, strengthening regulatory capacities, encouraging the development and diversification of quality local manufacturing, exploring innovative funding to reduce out-of-pockets payments, raising awareness, and improving clinical treatment guidelines. What We Found: Health facilities in many low- and middle-income countries are substandard and lack staff who are properly trained in administering antibiotics. In Uganda, 10 to 54 percent of health staff posts are unfilled because of poor pay, high stress, lack of resources, and poor management. Staffing on wards is inadequate to administer medicines, patients miss antibiotic doses, and public nurses sometimes request compensation for administering medicines. In India, there is one government doctor for every 10,189 people (the World Health Organization [WHO] recommends a ratio of 1:1,000), or a deficit of 600,000 doctors, and the nurse:patient ratio is 1:483, implying a shortage of 2 million nurses. Weak drug supply chains fail to make antibiotics consistently available. In Uganda, researchers found that many products were stored and transported long distances without cold-chain temperature control, and only 47 percent of medicines on the WHO’s Essential Medicines List were procured through the centralized authority, resulting in chronic shortages. Moreover, public-private supply chain delivery systems were not leveraged to improve drug availability outside specific programs. Why It Matters: Antibiotic resistance is an emerging global public health threat spurred by the overuse and misuse of antibiotics. 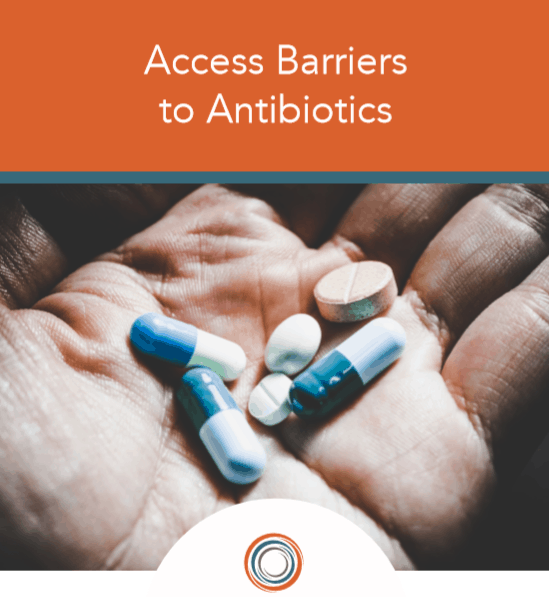 While “overuse” of antibiotics is widely accepted as a major health challenge, it is less well known that many people in low- and middle-income countries continue to die because they lack access to antibiotics. The majority of the world’s annual 5.7 million antibiotic-treatable deaths occur in low- and middle-income countries where the mortality burden from treatable bacterial infections far exceeds the estimated annual 700,000 deaths from antibiotic-resistant infections. The full report is available for download above.